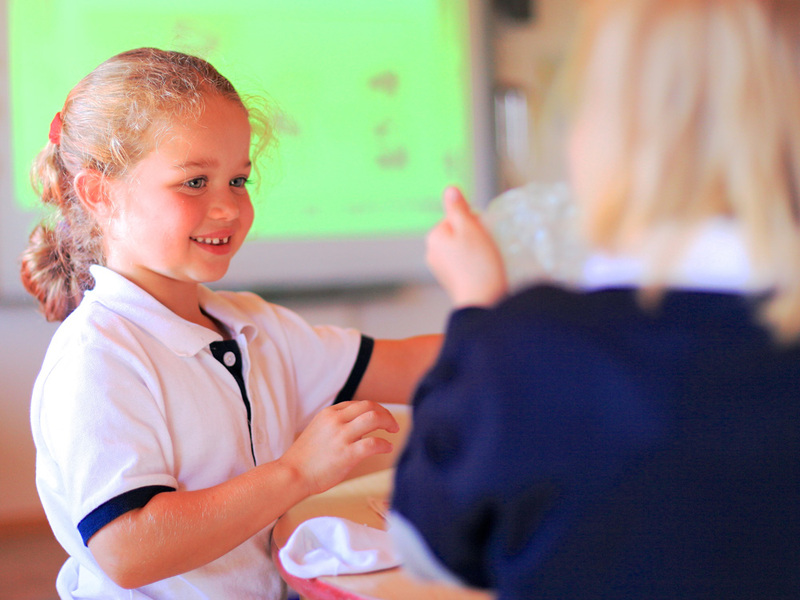 Key Stage 1 teaching focuses on listening, speaking, reading and writing. Individual targets are set and developed with each child to suit their learning needs. 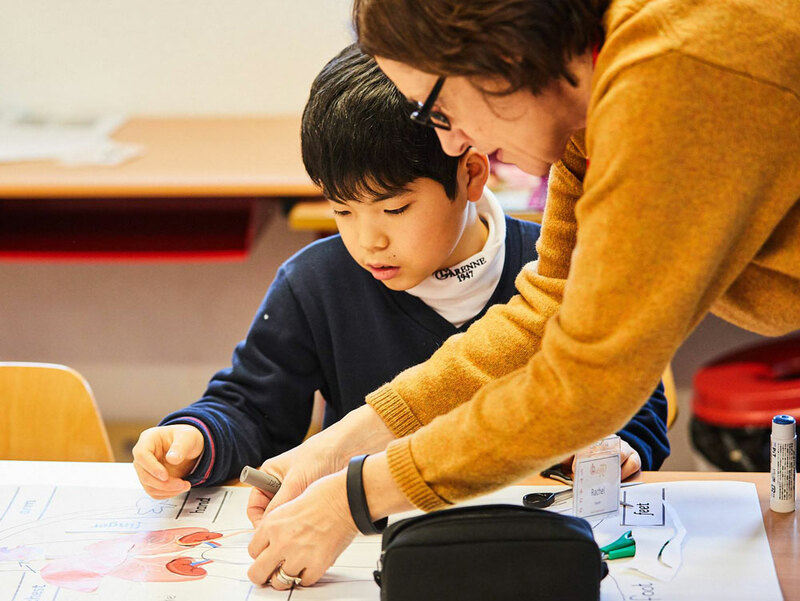 Each term children study a range of fiction, non-fiction and poetry from the UK and abroad, and links are often made to the IPC curriculum to make connections between the children’s learning. Good handwriting, knowledge of grammar and punctuation and phonics play an important role in spelling and reading unfamiliar words. Guided reading happens on a weekly basis and a love of telling, reading and writing stories is regularly brought to life with events such as Book Week and by visiting authors and storytellers. During Years 1 and 2 children develop confidence and mental fluency with counting and place value. 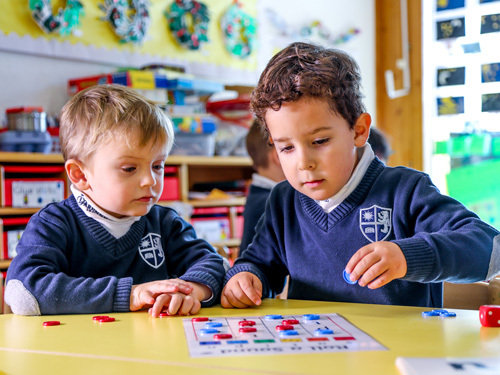 They use mathematical equipment and are immersed in a variety of language – a key factor in developing mathematical vocabulary. Differentiated lessons are delivered to ensure every child receives appropriate challenge and support. At La Garenne the children are encouraged to think creatively about the world around them and are encouraged to develop their enquiry skills from an early age. In Key Stage 1 they are introduced to science through age appropriate experiments as well as being linked to the IPC where appropriate. During Key Stage 1 children study a range of units, which are age-related and based around a theme. These help the children see the ‘big picture’ of their learning, making connections through and across different subjects. Across the IPC units the subject learning goals are Language Arts, Mathematics, Science, ICT & Computing, Technology, History, Geography, Music, PE, Art and Society. Each IPC unit of work includes specific tasks related to ‘International’ as a subject in its own right. Key Stage 1 students receive three lessons a week of ‘French as a Foreign Language’ from our highly experienced native French teachers. The classes are split into two levels, which allow the teachers to differentiate the lessons accordingly. The children develop their speaking, listening, reading and writing skills. In Key Stage 1, songs, games and simple conversations help introduce everyday vocabulary to the children, making learning exciting and fun. The children listen to a wide range of music from different times and cultures. They learn to use their voices expressively by singing songs and speaking chants. They develop their skills on percussion instrument, learn to create musical patterns and explore and organise musical ideas. Their aural memory is developed and they learn how pitch, dynamics, tempo etc. are used. Links are also made to the unit of work the children are studying in IPC. In Year 1 and 2 Music is taught by our specialist teacher. Key Stage 1 Art is a place for discovery. Students use a variety of materials to improve their dexterity and to begin to understand the effects that different mediums can have on a piece of art. Students experiment with cutting, gluing, painting, clay, collage and various drawing tools. Artists are introduced as a starting point for various activities and to develop the child's ability to discuss artwork. Students sometimes imitate the style of an artist, which can help boost their confidence, and freedom in their own art making. There are also moments reserved for bricolage related to certain holidays and free time to be creative when time allows. Each term at least one art project ties into an IPC theme that the students are following in their other subjects. Art is taught by our specialist Key Stage 2 teacher. The children following Key Stage 1 are immersed in a range of both indoor and outdoor activities according to the time of year, making the most of our beautiful mountains and alpine air. They have opportunities to work as individuals, in a group or as part of a team. Children develop core movement, become increasingly competent and confident, and access a broad range of opportunities to extend their agility, balance and co-ordination. We want each child to become physically confident in a way that supports a healthy and active lifestyle. Key Stage 1 lessons include skiing, gymnastics, parachute games, gymnastics, acrobatic gymnastics, ball games and athletics.